Issue #004 11/25/09 MUSCLE CONFUSION™! Like a pterodactyl backing out of trouble—kah, kah! With the popularity of P90X®, the term Muscle Confusion™ is getting a lot of play in the media. And while many people credit it as the reason P90X is effective, not many people understand what it means, much less how it works. Today, we'll briefly examine what Muscle Confusion is and why it's so effective. I think it will be easier to comprehend if we work backward. The whole idea is based around creating a fitness peak. P90X starts and ends with a fit test. We don't have you take the fit test mid-program because your progress curve is not supposed to be steady. Instead, the program is designed with phases that take a while to master. As you are attempting this mastery, confusion reigns, and your performance may not be all that great. But when you put it all together, and the various bits that have been confusing your body all come together, the result is a period of peak fitness. One of the concepts that seems the hardest to impart to our P90X athletes is how (or why) to peak. Most Xers don't consider themselves athletes because they lack performance-oriented goals—they just want to look good or feel better. But it's important to understand that all training at the level of P90X adheres to athletic principles. And athletic training always builds around a peak period when you need your body to perform at its best. Following this template doesn't just work for athletes. It works for anyone training at a high level. The entire theory of Muscle Confusion is based on something called periodization, which is basically training in targeted cycles that keep your body from getting too used to your schedule. The goal of periodizational training is to minimize performance plateaus and keep your improvements happening for a specific amount of time. All periodized programs are structured with a progression of training blocks designed around a peak. This is why most of our customers get their best results during the latter phases of our programs, especially with P90X. The training blocks are laid out with a plan. Your body begins each block faced with something new. This forces you to adapt to it. The stress of this process leads to accelerated improvements. When your body is used to the new regimen, it has a short period where it makes even greater improvements, which is called a growth or mastery phase. Finally, you get so used to the training that your results begin to plateau, at which time it's best to transition into something else. You don't always want to be in a state of confusion, so it's important to be aware of when your body should transition. This can be difficult, but with experience, you get better at it. Moderately intense programs like Power 90®, customized for clients who are out of shape, have a structure that is less rigid because the adaptation period takes longer. Conversely, the fitter you are, the quicker your body reacts to training and the quicker it adapts. Most science shows that a 3-week-on, 1-week-off cycle of training is about as short as you can go to maximize the adaptive and growth phases. That's why we've used this in P90X. This isn't set in stone. If you read the fine print of your guide, you'll see that we do recommend that you set each block to your own schedule. Ultimately, what's important is that you halt the growth phase before a plateau occurs and that you see the full cycle through to its end. A friend of mine was in a wrestling tournament and his opponent's coach kept yelling to his wrestler, "Don't get happy! Attack!" His vitriolic approach was so over the top that my friend started laughing and almost lost, but his message was a verbal equivalent of Muscle Confusion. You teach your muscles something new until they master it. Then, before they get happy, you launch into something else and force them to respond. Although he wasn't speaking of Muscle Confusion, I think Arnold Schwarzenegger summed the process up quite succinctly in the film Stay Hungry. When asked why he didn't take it easy more often, he said, "I don't want to get too comfortable. I'd rather stay hungry." Got something to say? Chat with the writers and other readers this coming Monday, November 30th, at 7:00 PM ET, 4:00 PM PT, in the Beachbody Chatroom! 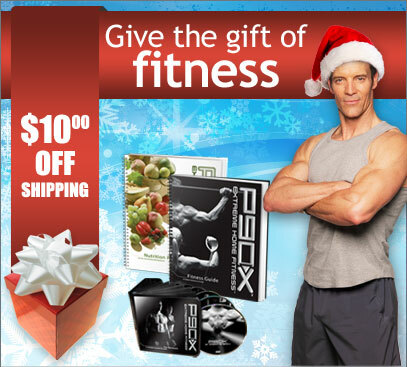 Tony Horton's 12 extreme workouts use the science of Muscle Confusion™ to get you absolutely ripped in 90 days. Plus Tony's offering you a special holiday savings offer—SAVE $10.00 through Dec. 14th. Short on time? Just give Tony 10 minutes, he'll give you results! Plus Tony's offering you a special holiday savings offer—SAVE $5.00 through Dec. 14th. Turn any doorway into a home gym in minutes! 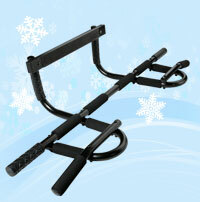 Build and strengthen your shoulders, back, and arms with this high-grade training tool featuring 12 grip positions. Warren Day was so overweight he had run out of numbers on his bathroom scale. When he found out his sister needed a kidney and he was too heavy to donate, he discovered the motivation he needed to get in the best shape of his life and help save his sister's life at the same time. Click here to watch a story of true brotherly love. The Thanksgiving-to-New-Year's holiday season can be a fun time of celebrating with friends and family . . . But if you're not careful, it can also turn into a 5-week festival of overeating. Not only is this period associated with heavy winter comfort foods, but seasonal treats and big holiday meals can be a minefield for people trying to stick to a fitness plan. It's no wonder so many people end up dieting in January just to make up for their recent excesses. But as someone committed to developing and maintaining a fit body, you should know that it's possible to enjoy the season without feeling deprived or looking like a party pooper. Follow these tips, and you can have a fun time and maintain your weight—or end up even leaner than before. Forget the preemptive diet. A new British study has found that lots of women crash-diet before the holidays in preparation for the overindulging they'll do during the season. But your goal should be to learn healthy eating habits that you can stick with over the long term, not to lose weight now just so you can gain it back later. That's likely to lead to a yo-yo dieting cycle, which could lower your metabolism and make fat loss more difficult than ever. Instead, make the decision now that you'll eat reasonable portions later (even on Thanksgiving), and you won't have anything to make up for. Stick to your workout program—or start one. We recently gave you some tips on how to keep up with your fitness plan over the holidays (see "Stay Fit This Holiday Season" in the Related Articles section below). Here's another reason why you should stick to your plan: exercising and eating right go hand in hand. When you're working out, the food you eat is used for energy and muscle gain, not fat gain. So you'll naturally want to eat foods that fuel your body, instead of junk that detracts from your performance. And if you do indulge in occasional treats, your regular workouts will help prevent them from doing much damage. Remember, you're building a habit of fitness that will last you a lifetime. When better to work on it than during the busiest period of the year? You'll learn how to devote time to your own well-being every day, even when you have a lot of other things to do. (Use your fitness program's workout calendar or WOWY SuperGym® on TeamBeachbody.com for scheduling support.) And when your friends and family see you getting leaner and fitter while they're poking new holes in their belts, you'll be an amazing inspiration. Stick to your food plan, too. Eating right isn't just a matter of avoiding too many junky foods. It means getting enough healthy foods, too. That's especially true if you're doing a high-intensity workout program like P90X. Your muscles require plenty of protein and other nutrients to grow, so missing meals can make your workouts less effective and cause at least some of your hard work to go to waste. To get through the more hectic periods during the season, make sure you have all the foods and supplements you need on hand, and plan your daily schedule so you're never too busy to eat when you should. Be careful with comfort foods. When it's cold outside, you may be tempted to cocoon indoors with hot, hearty meals and snacks. This isn't necessarily a problem if you make fitness-friendly choices. (Check out "3 High-Protein Winter Stew Recipes" and "Stay Warm, Lose Weight: 4 Diet-Friendly Hot Drinks" in the Related Articles section below.) But if lousy weather or a lack of sunshine makes you crave carb-heavy dishes, prepare them with healthier carbs like root vegetables and whole grains, not macaroni or mashed-potato flakes. And make them part of a balanced meal, not the whole meal. Plan ahead for parties. Cocktail parties can be the downfall of any food plan, but they don't have to be. First, if you're expecting to be served treats or hors d'oeuvres instead of healthful food, have a protein-rich snack before you go. It'll prevent you from gobbling up appetizers or sweets out of sheer hunger, and it'll help keep your blood sugar steady even if you do have a few cookies or crab puffs. If there's a buffet, watch your portions carefully—it's easy to pile on the food, especially if there are a lot of choices you want to try. And if it's a potluck, bring along a dish that's both tasty and healthful—it'll guarantee there's something good for you to eat, and others will probably appreciate it, too. Don't stress out. A recent study at the University of California, San Francisco confirms what you already know: You're more likely to eat high-calorie comfort foods when you're under chronic stress. And the holidays can be a perfect storm of stressful conditions and treat availability. You probably can't avoid the annoyances that come with holiday crowds, too little time or money, or lengthy family get-togethers, but you can keep them from getting you down. If you're working out regularly, you already have a leg up on the average person, because exercise helps you reduce tension and keep your mood upbeat. In fact, a recent study at Princeton University found that exercise may actually create new brain cells that are more resistant to stressful experiences. Help yourself even more by doing something relaxing for a few minutes each day, whether it's yoga, meditation, or simply listening to calming music. And if you do start feeling stressed, stop for a few seconds and take slow, deep breaths instead of reaching for an extra snack. Don't abuse the booze. Yes, a glass of wine or champagne can be a nice way to celebrate the season, and it's pretty much obligatory on New Year's Eve. But too much drinking has all kinds of negative effects: extra calories (which your body will burn while storing carbohydrates), lowered inhibitions (which can lead to overeating, or behavior that will require an apology later on), and a feeling of sluggishness or worse the next day that can derail your fitness plan. As long as you're an adult and don't have problems with alcohol, an occasional drink or two is fine. But if your cheeks regularly get as red as Santa's, your belly may eventually resemble his too. Avoid the food-gift trap. You could stay away from heavy sweets all year and still find it hard to resist Grandma's special fudge, even if the box contains 2 full days' worth of calories and enough sugar to fuel an army of hummingbirds. So what should you do with food gifts? Store-bought baskets of fatty sausages and "cheese food" are fine to regift (or donate to a food bank), but homemade goodies are trickier. You'll have to be polite and enjoy a little, preferably in the giver's presence. Leave the rest out for the family to share, or bring it to work (where it'll probably be devoured quickly). If it's a treat you really love, divide it into small pieces and freeze them in individual baggies, so you won't be tempted to eat it all at once. Give yourself a break. If you do overindulge at some point, don't beat yourself up about it, or decide to give up entirely and start over in January. As long as you have a consistent fitness program, you're unlikely to lose the progress you've made. Just keep Pushing Play every day, go back to your food plan, and look forward to your healthiest holidays ever. "Stay Fit This Holiday Season"
"3 High-Protein Winter Stew Recipes"
"Stay Warm, Lose Weight: 4 Diet-Friendly Hot Drinks"
Forget that gelatinous, can-shaped cranberry side dish, or the cranberries laced with enough sugar to put you into a coma. If you want to get your tart on this holiday season, try this healthy Shakeology® drink, fresh from the Beachbody® test kitchen. Blend ingredients till frothy, and enjoy!